Professional Blackjack is a bestselling book Stanford Wong. Wong is famous for developing back-counting, a card counting technique used to increase winnings in blackjack. But aside from “wonging” or back-counting, he has also made important contributions in the world of blackjack by writing educational books and making blackjack game more popular not only among casino visitors, but among all people. Wong is also a member of the elite group MIT Team, a group that was able to earn millions of dollars in group counting. 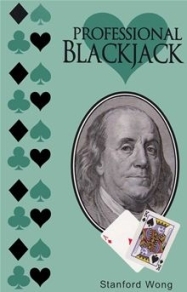 This particular book consists of 350 pages and revolves around card counting in the game of blackjack. It is ideal for both novice players and experts. Professional Blackjack describes high low method, which is known as a card counting method. High low method is very popular today and most casino players use it. The book also describes halves, which is another card counting method. This one is more advanced compared to the others and yields excellent estimates. The book that was published in 1994 included 100 tables aside from the appendixes. The tables offered strategy index for various rules of blackjack. The book also features different simulations for every set of rule to help players understand how one is better than the other. Stanford Wong was the one who was able to make significant research in the high low method of card counting. He was not the proponent of the technique, but he surely made an important mark and shared it via the book Professional Blackjack. The book is highly comprehensive and reader friendly. It starts by letting readers become familiar with the common terms used in playing blackjack. Aside from that, basic strategies are described. After that he describes high low system in detail; how it works, how it is helpful and many other useful things. It is surely the book to own if one has to learn about the card counting technique and plan to use it in real game. Stanford Wong also tells strategies about the complex halves count strategy which is very effective even with other games such as Over Under 13, a game played in many casinos. The author’s real name is John Ferguson, and he is a native of Georgia. He was born during World War II. Growing up, he became very interested in different games, and takes interest in developing winning strategies in every game he played. Among these games was tic-tac-toe which he said he was not interested to play with other children. Wong became curious as to how he can best win the game. Devising strategies stuck with him that is why he was able to come up with bestselling books such as Professional Blackjack. He became inspired in devising strategies for blackjack when he read Ed Thorp’s Beat the Dealer in 1963. He spent a great deal in learning how to count cards and later by the age 21, he traveled to Reno, Nevada and played at a casino where he won right away. He played blackjack and started earning more from it by teaching. He left his teaching job and decided to become a professional blackjack player. Professional Blackjack is considered as the blackjack bible so do not miss a chance to read it.